RALEIGH (January 17, 2019) – The key to a student’s academic success is a strong foundation – and that foundation needs to be built before formal schooling even begins. So a group of North Carolina business leaders called Thursday for the state to revamp funding for its nationally recognized pre-kindergarten program so that it reaches more eligible children. “We’re focusing on 33,000 children who are eligible for high-quality NC Pre-K, but can’t get it,” said Jim Whitehurst, president and CEO of Raleigh-based Red Hat. Even when the state provided funds for 1,750 additional 4-year-olds in 2017, Whitehurst said, 44 counties declined the additional money. And 33 counties declined state help when funds for another 1,775 children became available in 2018. “It is even more imperative today that we expand access to NC Pre-K based on research from Duke University,” said SAS CEO Jim Goodnight. Dale Jenkins, CEO of Medical Mutual Holdings, said investments in pre-kindergarten have implications for higher education and the greater economy. While proficient readers are much more likely to graduate from high school and seek post-secondary degrees and training, he said, students who are not proficient readers by 3rd grade are four times more likely to drop out of high school. 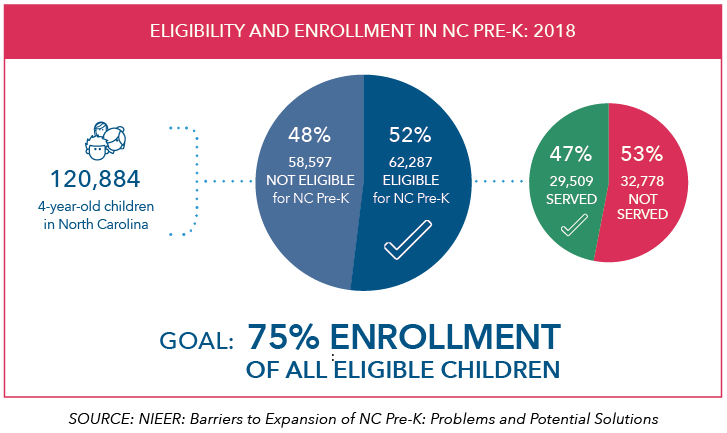 With increased state funds in recent years, NC Pre-K reaches roughly half (47%) of the state’s eligible 4-year-olds. “That’s a lot of progress, but quite frankly, 50% isn’t enough,” Jenkins said. The CEOs suggested 75% of eligible children is a reasonable, attainable goal. State legislators have used elimination of a waiting list as a metric for NC Pre-K funding, but the CEOs say that’s not the right way to measure the need. “Those lists are incomplete data at best,” said Jim Hansen, Regional President of PNC Bank. The lists can be compiled differently from county to county, and some eligible families don’t apply, either because they aren’t aware of the program or don’t think they’ll get in. The state covers 60% of the cost of NC Pre-K, while counties must cover the remaining 40%. State reimbursements have remained at the same level since 2012, there are restrictions on how the state money can be used, and some counties have trouble finding qualified teachers, said Charles Bowman, Local Market Segment Executive for Bank of America. SAS and PNC hired The National Institute for Early Education Research (NIEER) at Rutgers University to analyze the barriers to expansion of NC Pre-K.
As for the local match, “Increasingly, counties are finding these funds are simply tapped out,” W. Steven Barnett, author of the NIEER report. Barnett agreed that pre-kindergarten does indeed have implications for both secondary and post-secondary education, since grade retention, assignment to special education and 3rd-grade reading proficiency are the strongest indicators of whether a student will finish high school. “Pre-school should be thought of as the first step in systemic reform … that reaches all the way up,” he said. Develop targets to reach 75% of eligible children statewide, with particular attention to underserved populations. Offer incentives for 4- and 5-star private child-care centers to meet the higher standards of NC Pre-K and receive state funds. Increase state reimbursement rates to address rising costs and specific barriers such as startup costs. Provide supplements for NC Pre-K teacher compensation to achieve parity between private centers and public schools. Increase the artificially low 4% of total funding cap on administrative costs. Explore use of child-care subsidies and NC Pre-K funds to serve the same child.